Stink bugs can destroy your garden in short order and they smell pretty bad! Bagrada bugs (Bagrada hilaris) are black with red and orange markings; invasive. Brown marmorated stink bugs (Halyomorpha halys) are mottled grey-brown invasive stink bugs. Consperse stink bug (Euschistus conspersus) is grey to greenish brown, with spotted legs. Green stink bug (Acrosternum hilare) is bright green with red, orange or yellow edges. Harlequin bugs (Murgantia histrionica) are shiny black with yellow, orange, and red markings. Rough stink bugs (Brochymena sulcata) are predators! Say stink bugs (Chlorochroa sayi) are green with a white border. Southern green stink bugs (Nezara viridula) are bright green; larger than other species. Stink bug eggs are laid in clusters of tiny barrel shapes on the underside of leaves in spring and fall. Before hatching, the eggs can be white, yellow, green, buff, or even pink. When they hatch, the cluster will be covered with tiny brownish-orange babies, called first instar nymphs. Each instar is a developmental stage that is achieved through molting. 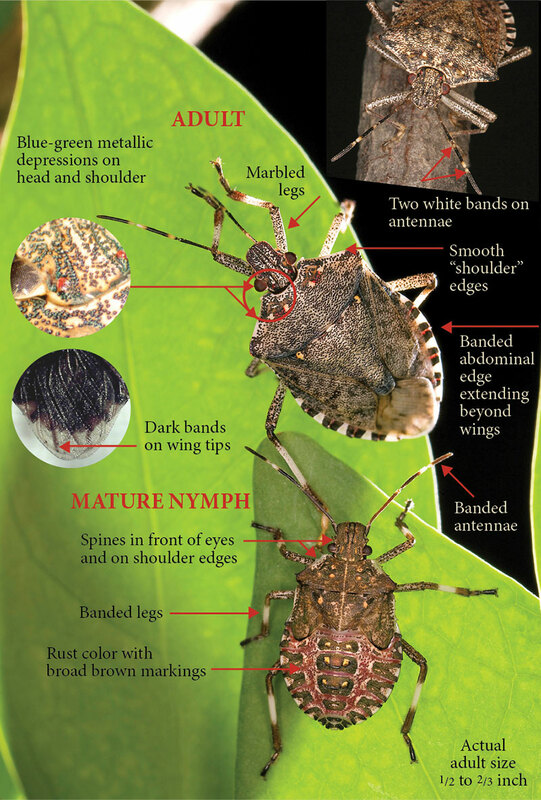 Stink bugs have five instars before reaching full size. Stink bugs can have 4 generations every year and each female can lay hundreds of eggs at each laying. Yup, they add up fast! There are 250 varieties of stink bugs in the U.S. and 4700 worldwide. They can be brown or green. Stink bugs eat seeds, grain, fruit, vegetables, ornamental plants, legumes, weeds and tree leaves. They can also transmit tomato bacterial spot with piercing mouthparts. Unfortunately, insecticides are ineffective against stink bugs. Wasps and flies, such as the tachinid fly (Trichopoda pennipes) and the Trissolcus basalis wasp will parasitize the eggs, but those critters are not always available when you need them. You can also provide habitat for birds, spiders, toads, and other insect eating critters. The best method of control for stink bugs is to handpick and deposit them in a container of soapy water or feed them to your chickens! No, deficit irrigation doesn't refer to balancing the national budget. Instead, it is a method used by growers to increase the amount of sugar in foods such as tomatoes, pomegranates, and peaches. When the water supply is significantly reduced, there is more sugar in each fruit than is found in plants watered consistently through harvest. In fact, all the compounds that create flavor are enhanced. It's a simple matter of dilution! The downside of deficit irrigation is the risk of stunted growth and smaller fruit. In the case of backyard tomatoes, it's a good idea to significantly reduce watering as the fruit begins to turn red. This way, the size is already reached and flavor is in full production. Deficit irrigation also helps conserve precious water resources! Who doesn't love garlic? Add some melted butter and you can make just about anything taste amazing. What's even better - it's easy to grow! Cousin to onions, shallots, chives, and leeks, garlic is a member of the Allium family. So why talk about garlic in the middle of August? Most of us gardeners are currently dealing with an over abundance of tomatoes, zucchini, and cucumbers, but fall will be here before you know it. Rather than let your valuable garden real estate go fallow, you can chop up plant material, as plants end their productive cycle, and use this valuable resource to prepare your winter crop beds. Lay the material on top or dig it in a few inches. By the time October rolls around, the worms will have created the perfect growing medium for your garlic. Garlic can be grown in containers, shade gardens, on balconies or windowsills, or in traditional garden rows. As a bulb, it is a resilient plant that can fit into practically any landscape. While you can certainly grow new plants from a garlic purchased at the grocery store, you are better off buying starts from a reputable grower. Grocery store garlic is safe to eat, but it may harbor diseases that can harm future crops for many years. ​Garlic comes in two basic forms: hard-neck and soft-neck. The soft-neck variety stores better, but the hard-neck variety produces bigger cloves that are easier to peel. When you are ready to plant, simply separate the cloves from a garlic and plant them approximately 6" apart and 1" deep, with the root end down and the pointy end up. That's it! Garlic has been cited as a cure-all and demon-repellant, among other questionable attributes, but science has shown that garlic really does repel aphids, cabbageworms, codling moths, Mexican bean beetles, peach borers, and even slugs and snails. In my book, that makes garlic worthwhile simply as a natural pest and disease inhibitor. Of course, I love to eat garlic, so I would plant it anyway! Unlike onions, whose leaves are a tube, garlic leaves are flat. When the leaves start to turn yellow and fall over, gently remove them from the ground, dust off the dirt, and put them in a shady spot for a couple of weeks. If you feel inspired, you can then try braiding your garlic crop, but I have found that it's a lot harder than it looks! Be sure to save your very best garlic for planting in the following fall. Over time, your garlic crop will be become better acclimated to your microclimate and produce even better harvests! The Oriental fruit fly is an invasive pest that was found in the Bay Area during the summer of 2015. The damage done by this pest can be extensive, so any time it makes an appearance, the state and federal government immediately declare war, putting a series of countermeasures in place to eradicate this pest. Most estimates make the Oriental fruit fly as destructive as the Mediterranean fruit fly. The Oriental fruit fly (Bactrocera dorsalis) is slightly larger than your average housefly. It tends to be bright yellow with a dark “T” on its abdomen, though other colorations have been seen. The wings are clear, with a dark outer edge. Maggots are slightly less than one-half inch long and yellowish-white. Females use a pointed ovipositor to lay eggs under the skin of nearly 500 different host fruits. These crops include apricot, avocado, banana, citrus, figs, guava, loquat, mango, peach, pear, persimmons, pineapple, plums, and tomato. When eggs hatch, the larva, or maggots, begin feeding on the fruit, making it inedible. ​The Oriental fruit fly is a common pest in many parts of the world and it enters the U.S. through produce smuggled into the country. If you suspect that you have seen an Oriental fruit fly in your garden, please contact the USDA hotline at (202) 720-2791. Visit the Dept. of Agriculture’s quarantine map to see what quarantines, if any, may include your garden! Kaolin clay is an extremely fine form of clay used to create porcelain. It is also a deadly weapon against many garden pests, especially those that attack apple trees. Apple maggots, apple aphids, two-spotted spider mites, leaf hoppers, pear psylla, oblique banded leaf hoppers, and codling moths are all susceptible to the effects of kaolin clay. Kaolin clay powder creates a barrier between your fruit trees and common pests. Being edible, kaolin clay is nontoxic and can be used in organic gardens and orchards. There is no known danger to mammals or the environment posed by applying kaolin clay to your apple trees. To use kaolin clay on your trees, it is very important to attain total coverage. Every spot that is not protected can be a point of entry for pests and disease. The brand name is Surround WP and it can be applied in liquid form using a sprayer. Applications should be performed at fruit set, generally early June, and sprayed periodically through mid-August. Surprisingly, kaolin clay, while it looks like a film that would block sunlight, actually increases net photosynthesis and helps keep the tree cooler!